Alligator is a genus in the order Crocodilia. There are two living species: the American alligator and the smaller Chinese alligator. Together with the caimans, the gharials, and the crocodiles, they make up the order Crocodilia. The first alligators existed about 37 million years ago. However, older species of alligators have become extinct. An average adult American alligator weighs 360 kg (790 lb) and is 4.0 m (13.1 ft) long. However, they can grow to 4.4 m (14 ft) long and weigh over 450 kg (990 lb). The largest alligator ever recorded, found in Louisiana, was 5.84 m (19.2 ft) long. The Chinese alligator is smaller. It is rarely longer than 2.1 m (6.9 ft). In addition, it weighs considerably less than the American alligator. Male Chinese alligators rarely weigh over 45 kg (99 lb). Nobody knows how long alligators live, on average. An 80-year-old alligator named Muja, living in the Belgrade Zoo in Serbia, is thought to be the oldest alligator living in captivity. Although the alligator often moves slowly, it can run very fast for short times, especially in very short lunges. Usually, alligators' main prey are smaller animals they can kill and eat with a single bite. If the prey is not big enough to eat in one bite, they may drag the animal into the water to drown. They may also bite their prey and then spin or wildly until bite-sized chunks are torn off. This is called a "death roll". Alligators are generally timid towards humans and tend to walk or swim away if a human comes near them. However, they will attack humans to protect their nests. In Florida, feeding wild alligators at any time is illegal. If fed, the alligators will eventually lose their fear of humans and will learn to associate humans with food, thereby becoming both a greater danger to people, and at greater risk from them. Alligators are native only to the United States and China. American alligators live mostly in the southeast United States. According to the 2012 Scholastic Book of World Records, Louisiana has the largest alligator population, with about two million. Most American alligators live in Louisiana or Florida, which is home to about 1.3 million alligators. Southern Florida is the only place where both alligators and crocodiles live side by side. American alligators cannot live in saltwater very long because they do not have salt glands. Because of this, they live in freshwater environments, such as ponds, marshes, wetlands, rivers, lakes, and swamps, as well as in brackish environments. Once, the American alligator was endangered. In the 1970s, the United States government protected alligators under the Endangered Species Act. The species made a major recovery and are now thriving in many wilderness areas. The alligator is the state reptile of Florida, and is a symbol of the state. The Chinese alligator currently is found only in Eastern China, in a small area in the Yangtze River basin (along the coastline of the Atlantic Ocean. The Chinese alligator is extremely endangered. Scientists believe that only a few dozen Chinese alligators are left in the wild. Indeed, far more Chinese alligators live in zoos around the world than in the wild. Rockefeller Wildlife Refuge in southern Louisiana has several in captivity in an attempt to preserve the species. Miami MetroZoo in Florida also has a breeding pair of Chinese alligators. American alligators were once an endangered species in the United States. By the 1950s, there were fewer alligators in the United States than ever before. This happened because of alligator hunting and because people were building over alligators' habitats. In 1967, the United States government listed the alligator as endangered. This meant the alligator was in danger of becoming extinct. Today, the American alligator is no longer endangered, but it is still a "protected species." It is protected because the alligator looks like some species of crocodiles and caimans, which are still endangered. Because of this, the Fish and Wildlife Service categorizes the American alligator as “threatened due to similarity of appearance.” Their goal is to prevent people from killing endangered crocodiles and caimans because they have mistaken an alligator for a crocodile or caiman. Because of this, killing alligators, and trading in products made from alligator meat or skin, are all regulated by the Fish and Wildlife Service. Crocodiles have salt glands, so they can live in saltwater habitats. Alligators usually live in freshwater habitats. Most alligators have wide snouts that are shaped like a U. Usually, crocodiles' snouts are longer, narrower, and are shaped like a V. However, some crocodiles do have wide snouts. When its mouth is closed, you can see the fourth tooth on a crocodile's jaw. You cannot see that tooth when an alligator's mouth is closed. Wikispecies has information on: Alligator. 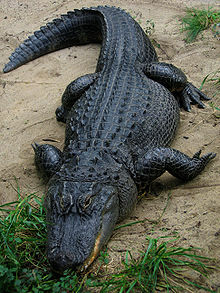 Wikimedia Commons has media related to Alligator. ↑ "Alligator Daudin 1809 (Alligator)". FossilWorks: Gateway to the Paleobiology Database. Paleobiology Database / Macquarie University. Retrieved 2016-06-02. ↑ "American Alligator and our National Parks". eparks.org. Archived from the original on 2016-03-04. Retrieved 2016-05-01. ↑ "Alligator mississippiensis". alligatorfur.com. Archived from the original on 2016-03-05. Retrieved 2016-05-01. ↑ Kaku, Michio (2011). Physics of the Future. Doubleday. pp. 150, 151. ISBN 978-0-385-53080-4. ↑ "The oldest alligator living in captivity". shekoos.wordpress.com. 2012-02-22. Retrieved 2013-08-07. ↑ Fish, Frank E. et al (2007). "Death roll of the alligator: mechanics of twist feeding in water" (PDF). The Journal of Experimental Biology 210 (16): 2811–2818. doi:10.1242/jeb.004267. PMID 17690228. http://darwin.wcupa.edu/~biology/fish/pubs/pdf/2007JEBDedathRoll.pdf. ↑ "Living with Alligators and Crocodiles". Florida Fish and Wildlife Conservation Commission. State of Florida. Retrieved 2016-06-02. ↑ 9.0 9.1 9.2 "Where Do Alligators Live?". Habitat Tracker. Florida State University. 2016. Retrieved June 2, 2016. ↑ 10.0 10.1 "Chinese Alligator". St. Louis Zoo. Retrieved 2016-06-02. ↑ 11.0 11.1 Morse, Jenifer Corr (2011). Scholastic Book of World Records 2012. Scholastic, Inc. p. 263. ISBN 978-0545331494. ↑ "Trappers catch crocodile in Lake Tarpon." Tampa Bay Times, July 12, 2013. ↑ "Species Profile: American Alligator (Alligator mississippiensis) - SREL Herpetology". Savannah River Ecology Laboratory – Herpetology Program. Retrieved 2015-11-17. ↑ Dundee, H. A., and D. A. Rossman. 1989. The Amphibians and Reptiles of Louisiana. Baton Rouge: Louisiana State University Press. ISBN 978-0807120774. ↑ 15.0 15.1 15.2 15.3 "American Alligator" (PDF). United States Fish and Wildlife Service. United States Department of the Interior. February 2008. Retrieved 2016-06-02. ↑ "Reptiles: Crocodilian". San Diego Zoo: Animals. San Diego Zoo Global. 2016. Retrieved 2016-06-02. This page was last changed on 6 March 2019, at 03:22.